The Swan Hotel, Sadler St., Wells, is still open for business. 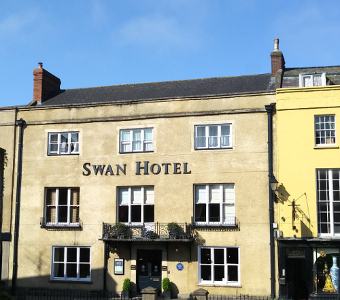 A beautiful autumn morning, they stood bathed in sunshine by the front door of the Swan Hotel in the town of Wells where they had stayed for a couple nights while visiting significant sites, Kate studying history and architecture. “There’s Father,” Kate said, glad to change the subject. Earl Beaufort and his valet, Rudman, strode up the street from the crowds of the market. “Above the Cheddar cliffs?” Kate brimmed with enthusiasm. “Excellent!” She grinned, then snapped to expressionless and stood ramrod straight upon making eye contact with her step-mother. “That leaves us with today to pursue something civilized,” Jane said with a frown. “Do you promise not to run off, exploring on your own again?” Earl Beaufort asked with a chuckle. “Oh! Yes! Of course!” Kate felt her face grow warm, remembering childhood bad behaviour. I would never do anything so inconsiderate now. Mrs. Crozier taught me… she would have beat my stuffing out for such a misdeed. “M’ lady.” Rudman doffed his hat and entered the hotel. Kate struggled to contain her emotions. Hurrah! When her parents turned away she performed a little hop of joy. 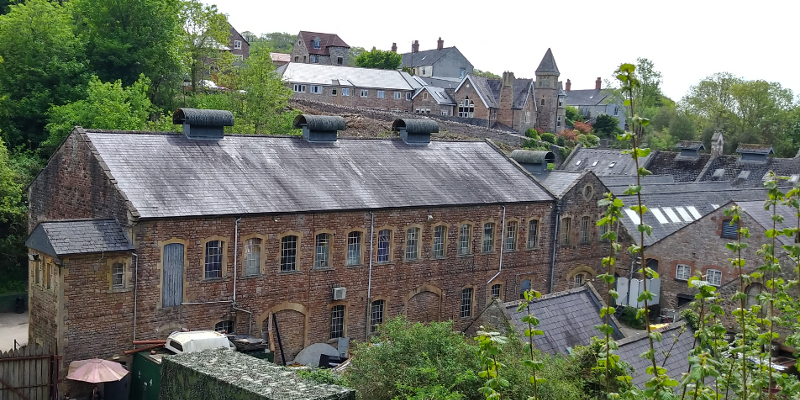 The paper-mill, Wookey Hole, a portion of the town visible on the hill. Kate sat restlessly in their carriage and peered out a window at the cottage Rudman had entered. The front door stood open. Her father waited at the gate. Beyond some trees she could see the paper-mill and town of Wookey, through which they had passed a few minutes ago. “Let’s get out,” Kate said to her maid, Isabel. Kate braced herself for an onslaught of unsought advice, but thankfully was spared by Jane’s maid, Miss Lydia Pierce. “Lord Beaufort waved to us,” Miss Pierce said just above a whisper without shifting a muscle. Kate, Isabel, and Jane, all swivelled to look. Reynold, a tall brawny footman, opened the door of the carriage. The ladies stepped down onto a dirt lane. The valet limped from the cottage, furnished with a lantern in each hand. A slender young woman followed, burdened with several lanterns, one already lit. Someone closed the door from within. Earl Beaufort politely bowed to the woman, then introduced her as ‘Miss Effie’ to everyone, making it clear who should be addressed by an honorific. Perhaps twenty years of age, Effie had small features with large clear hazel eyes and from beneath her plain cloth cap a long thick braid of shiny brown hair. She gracefully curtsied to everyone in a simple fashion. Kate remembered a small hunchbacked elderly man acting as guide from her previous visit. He was funny… I wonder if this is his granddaughter? She doesn’t look like him, she’s as tall as me. Effie led the party off the lane onto a path, followed by the Earl and Countess Beaufort, Kate close behind, then Isabel and Miss Pierce, then Rudman, and Reynold at the rear carrying the lanterns. Walking up a valley, the path ran beside a crystal clear brook, and soon cool air wafted over them. The sides of the valley became steep and rose higher until they entered a sort of natural amphitheatre; a horseshoe of steep cliffs, much of the rock covered by hanging ivy. Within the valley grew grasses, brush, and flowers, forming a wild green garden. Ravens perched upon a crag, and a kestrel hovered overhead. They crossed a stream and climbed a narrow path, arriving at an iron-bound door set under a low arch-shaped rock. 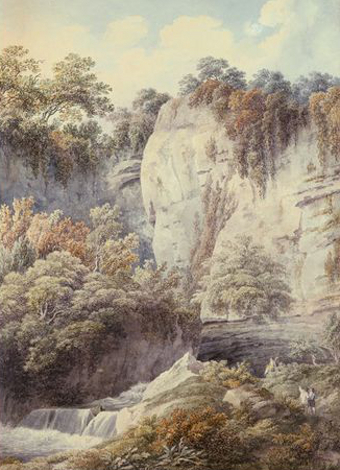 Wookey Hole valley circa 1794, a watercolour by M.A. Rooker (1743 – 1801). The entrance to the cave lay around to the left. “You’ll stand sentinel here,” Earl Beaufort said to Reynold. “My lord.” Reynold came to attention. Effie nodded, lighting the lanterns with a taper. “Thank you, my lady.” Isabel smiled. “Yes, my lady.” The maid glided to the side of Effie and collected a pair of the lit lanterns. Kate, disregarding her step-mother’s intention, that Miss Pierce was meant to somehow light the way for both ladies, took up another lantern. Once Earl Beaufort and Rudman were supplied with lights the party entered a low passage, which forced everyone except Jane and Rudman to stoop, although the latter had to remove his top hat. They stepped carefully along the uneven wet floor, each slipping at times, plashing through puddles, going up and down, but overall descending, lanterns clanking against the walls. They entered into a rounded chamber, the sides coated with smooth translucent runnels, and the ceiling dimpled with small stalactites, reflecting the lantern lights like diamonds. A gasp of awe escaped several lips. “May I begin?” Effie asked, taking an elevated position. “Once upon a time, a witch lived in this cave,” Effie began in hushed tones. “The witch had great power, knew all things, and could turn what she touched into stone. An evil spirit did her bidding. Perhaps it was the devil, but of this no one is certain. When the witch heard that our Saviour was born, who would put a halt to all witchcraft, she grew very sorrowful, and determined to destroy herself, but first to turn all she owned into stone. The first thing was her pipe, and here it is!” Effie held her lantern over an oddly shaped formation of slick rock. 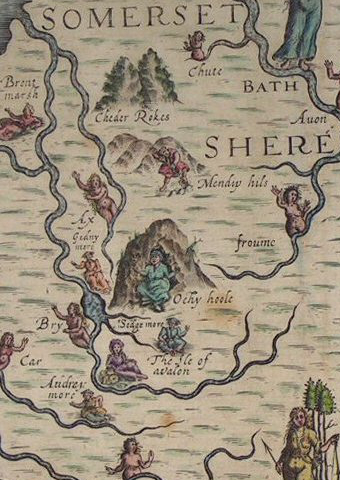 ‘Ochy Hoole’ with a water nymph at the entrance, shown on a map drawn by M. Drayton, 1612. “If that’s her pipe, she must have been a giant,” Jane said. Kate sidled closer. It looks like an upside down wheelbarrow. Everyone laughed. Kate recalled the tale from her previous tour. 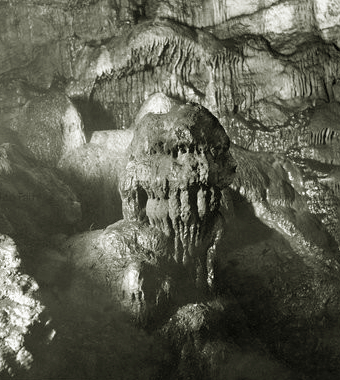 They shuffled into a long chamber with an uneven floor and held their lanterns up to view the unusual formations and stalactite grottos. “And there is a rabbit, saved for her dinner,” Effie continued. “It’s been skinned,” Effie explained. “And this is her turn-spit dog.” Effie moved along the chamber. “Here you see the old witch’s cupboard, where she kept bread and cheese. And this is a pillar of salt.” Effie placed her hand on a smooth white column of shiny stone. “Sometimes it is,” Effie said. “Wind blows down from crevices in the Mendips,” Effie explained as she turned and entered another corridor. “There is almost always fresh air here. Look at this.” She held her lantern up to where moss and small ferns grew from the side of a chimney-like shaft. “Spiders!” Kate declared with a laugh, seeing webs. Everyone gathered by the large round formation. Kate perceived faint letters and numbers carved into the rock. They entered the largest of the chambers with a steeply sloped floor. “We are now in the Great Hall,” Effie said, spinning slowly with her lantern held high. Again, gasps of awe escaped several lips. Amazing. Kate scanned the sparkling rock. The stories were more fantastical before. The cavern is somehow better. Intriguing… marvellous… but it’s a great deal smaller than I remember. The Wookey Witch, first photographed in the late 1800s. “That must be it.” Kate grinned at her father. “Here is the hole the terrier went in.” Effie pointed. Kate minced to the opening and crouched to stare into the blackness. She felt a breeze upon her face. “For you, Miss Effie,” Earl Beaufort said, handing her a gold coin. Kate stood on the edge of the brook and leaned out with her lantern, trying to see farther up the cavern. She flinched upon hearing a metallic crash and glass shattering, and almost stumbled into the water. Kate turned to see Miss Pierce sitting awkwardly, one lantern held up while the other smashed. “Are ya all right?” Rudman knelt in front of the maid. “Let me help,” Kate said. Without a word, Effie accepted lanterns from Miss Pierce and Rudman, while Kate took the one held by her father. Supported by the men, Miss Pierce tried to stand. She didn’t make a sound, stood upright, took a small step, and collapsed against Rudman’s shoulder. Kate, standing in front of Miss Pierce, saw her shudder and espied tears dripping from the maid’s eyelashes. Without awaiting consultation, Kate ran up the slope and dashed from the chamber, lanterns swinging wildly from each hand. She sprinted through the Witch’s Parlour and slipped twice while passing through the Witch’s Kitchen. Abruptly, she skidded to a halt at a wall of slick rock. Pirouetting, a bit panicked, she ran back and found another corridor and cheered upon navigating around the upside down wheelbarrow rock. She slowed to a jog while going by some crevices and leaping over puddles, and crouched as the ceiling grew lower, then saw a vertical line of light. The door to the cavern lay ahead, open only a crack. Kate reached the door and pushed it wide, momentarily struck blind by the sunlight. She focused and spotted Reynold and Isabel sitting on a bench in the valley. The footman and maid sprang to their feet and hurried towards Kate. “My lady?” Reynold prompted, holding out a hand to take a lantern. Kate led Reynold through the cavern at a jog. When they reached the Great Hall, everyone stood in a circle except Miss Pierce, who sat on a stool-like formation of rock. She clutched a handkerchief and dabbed her eyes. “My lord.” Reynold went down on one knee beside Miss Pierce. He scooped her up like a child. Effie started out of the chamber, followed by Reynold. When the party emerged from the cavern, Reynold took a moment to rest, setting Miss Pierce on the nearby bench and sitting beside her. Kate stood in the sunlight with her parents at the door. Wisps of steam rose from their wet clothing. Miss Pierce kept her head down, beautiful auburn ringlets hiding her face. Kate watched Isabel, looking for some sign of jealously in regards to Reynold. She discerned nothing as Isabel sat on the other side of Miss Pierce and they whispered to each other. “There are more caverns to visit in Cheddar Gorge,” Kate sang softly, fully aware it was likely an unwelcome suggestion. 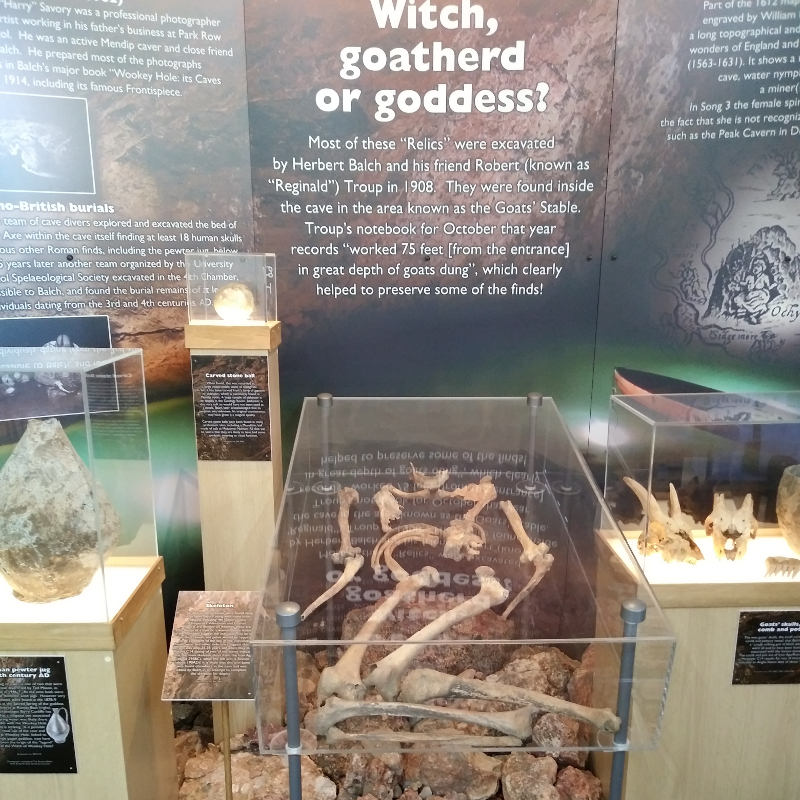 In 1908 the remains of a woman and her meagre possessions were excavated from under layers of packed goat dung, about 25 metres from the entrance within Wookey Hole Cave. Of note, she had an alabaster orb that may have served as a scrying glass/crystal ball. 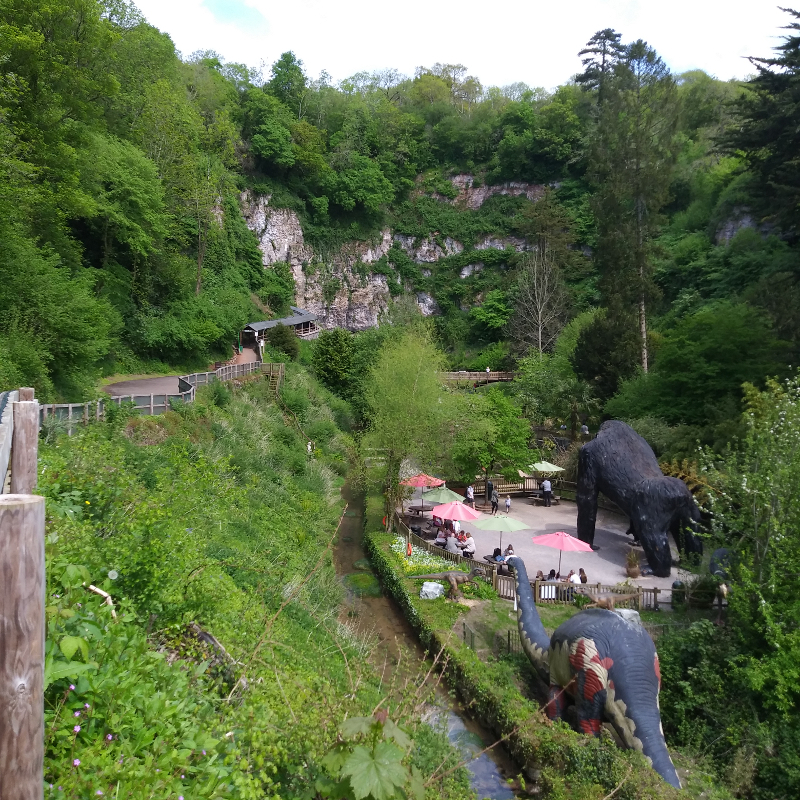 The Witch’s Cave of Wookey Hole is now part of an unusual theme park. The valley is much altered from the mid 1800s. This is a fun story. Witches and fairies are always facinating. Kate has some great adventures.